Sometimes, the messiest activities are the most educational ones. Don’t be afraid to make a mess with your child. 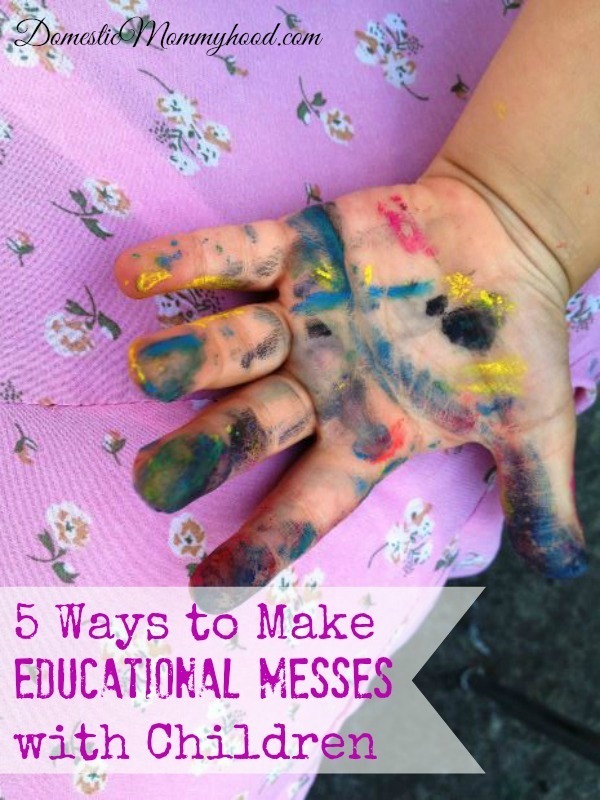 Instead, take a look below at 5 Ways to Make Educational Messes with Children. You will quickly find that making messes together is the perfect way to provide a learning opportunity. All kids like to get down and dirty and what better way to be creative and help them learn! You may also want to try these fun ways to make educational messes with children! 1. Explore a sensory bin. Fill a tub with water, dirt, or sand. Toss in a variety of scooping and measuring tools. Allow children to practice using the tools, manipulating the objects and getting some fine motor skill practice in. This is a great way to also practice measuring! 2. Have some shaving cream fun. Spray some shaving cream on a countertop, table, or on a cookie sheet. Let children use their fingers to craw shapes and practice making letters and number. This is a great hands-on way to practice these skills while making a fun mess in the process. 3. Mix up some colorful magic. Explore colors with food coloring and water. Fill glasses with water and see what hues you can make by mixing the food coloring. This is a great way to explore the rainbow and learn about primary and secondary colors in the process. Find a recipe and create it together. There will be lessons in direction following, measuring, and math involved. Sure it will get messy, but when you cook together there is the opportunity to teach your children invaluable lessons they won’t be soon to forget. 5. Get your feet dirty! Head outdoors and explore nature hands on. Dig in the dirt, catch bugs, gather leaf and rock collection, or explore a local pond. You are sure to get dirty, but you will learn a great deal about the environment in the process. Exploring nature teaches so many lessons about animals, habitats, plants, and more. So head outside and don’t be afraid to get dirty. Here are some messy educational toys that my kids have loved using! Here are some great books that we have used to make some fantastic educational messes at home! Give these 5 ways to make educational messes with children a try. They are the perfect way to teach your children in a way that is frugal, fun, and of course, MESSY! These are great ideas on messy fun! I love letting my daughter get messy and am less apprehensive about it when we can take it outdoors! !